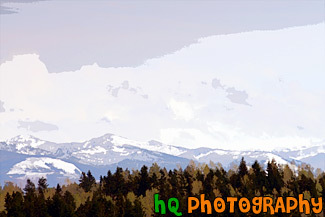 A scenic picture taken of the Cascade Foothills located in Washington State near Mt. Rainier. In this photo you can see snow on the foothills, green evergreen trees in the foreground and some low clouds hovering over the mountains.